A series of fluid end parts could be provided, interchangeable with Mission Magnum I, and 2500 Supreme, halco 2500. The equivalent or same materials are selected to guarantee the unified quality. 3. 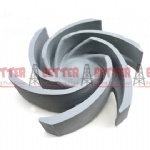 YYY－the metric diameter of impeller, therefore 12” is coede as 305mm, 11” is coded as 280mm.